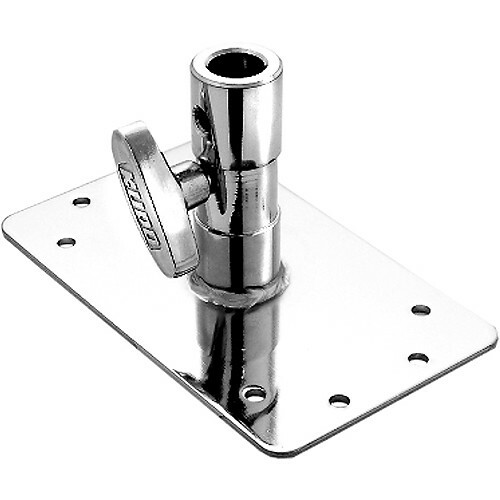 Constructed of chrome-plated steel, this Baby Receiver Wall Plate is a useful tool on any type of production set. The plate has a 5/8" receiver for light stands or other accessories with a 5/8" pin. Alternately, by removing the locking knob, the outer dimensions are 1 1/8"—ideal for use as a Junior pin for matching stands or other equipment. The plate's eight anchor points allow you to screw or nail it to the wall, ceiling, or the floor. By inverting it, the plate becomes the base for speakers or other gear. Box Dimensions (LxWxH) 12.25 x 7.75 x 3.45"